Electrochemical processes, such as electrolysis of brine without a membrane operating to form hypochlorite, will also produce bromate when bromide ion is present in the brine solution. Photoactivation (sunlight exposure) will encourage liquid or gaseous bromine to generate bromate in bromide-containing water. Bromate in drinking water is undesirable because it is a suspected human carcinogen. Its presence in Coca-Cola's Dasani bottled water forced a recall of that product in the UK. 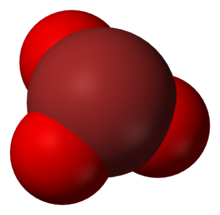 Although few by-products are formed by ozonation, ozone reacts with bromide ions in water to produce bromate. Bromide can be found in sufficient concentrations in fresh water to produce (after ozonation) more than 10 ppb of bromate—the maximum contaminant level established by the USEPA. Proposals to reduce bromate formation include: lowering the water pH below 6.0, limiting the doses of ozone, using an alternate water source with a lower bromide concentration, pretreatment with ammonia, and addition of small concentrations of chloramines prior to ozonation. On December 14, 2007, the Los Angeles Department of Water and Power (LADWP) announced that it would drain Silver Lake Reservoir and Elysian Reservoir due to bromate contamination. At the Silver Lake and Elysian reservoirs a combination of bromide from well water, chlorine, and sunlight had formed bromate. The decontamination took 4 months, discharging over 600 million US gallons (2.3×10^6 m3) of contaminated water. On June 9, 2008 the LADWP began covering the surface of the 10-acre (4 ha), 58-million-US-gallon (0.22×10^6 m3) open Ivanhoe Reservoir with black, plastic shade balls to block the sunlight which causes the naturally present bromide to react with the chlorine used in treatment. 30 million of the 40 cent balls ($12 million) are required to cover the Ivanhoe and Elysian reservoirs. Currently no bromate-bearing minerals (i.e., the ones with bromate ion being an essential constituent) are known. ^ "Potassium Bromate (Group 2B)". International Agency for Research on Cancer: Summaries and Evaluations. Canadian Centre for Occupational Health and Safety. Retrieved 2008-03-09. ^ Kurokawa, Yuji; Maekawa, A; Takahashi, M; Hayashi, Y (July 1990). "Toxicity and carcinogenicity of potassium bromate—a new renal carcinogen". Environmental Health Perspectives. Environmental Health Perspectives, Vol. 87. 87: 309–35. doi:10.1289/EHP.9087309. JSTOR 3431039. PMC 1567851. PMID 2269236. ^ "Coke recalls controversial water". BBC News. 2004-03-19. Retrieved 2008-03-09. ^ Neemann, Jeff; Hulsey, Robert; Rexing, David; Wert, Eric (2004). “Controlling Bromate Formation During Ozonation with Chlorine and Ammonia.” Journal American Water Works Association. 96:2 (February) 26-29. ^ "DWP To Drain 2 Reservoirs After Potentially Harmful Chemical Found". KNBC News. 2007-12-14. Retrieved 2008-03-09. ^ Vara-Orta, Francisco (2008-06-10). "DWP drops 400,000 balls onto Ivanhoe Reservoir". Los Angeles Times. This page was last edited on 24 February 2019, at 20:49 (UTC).